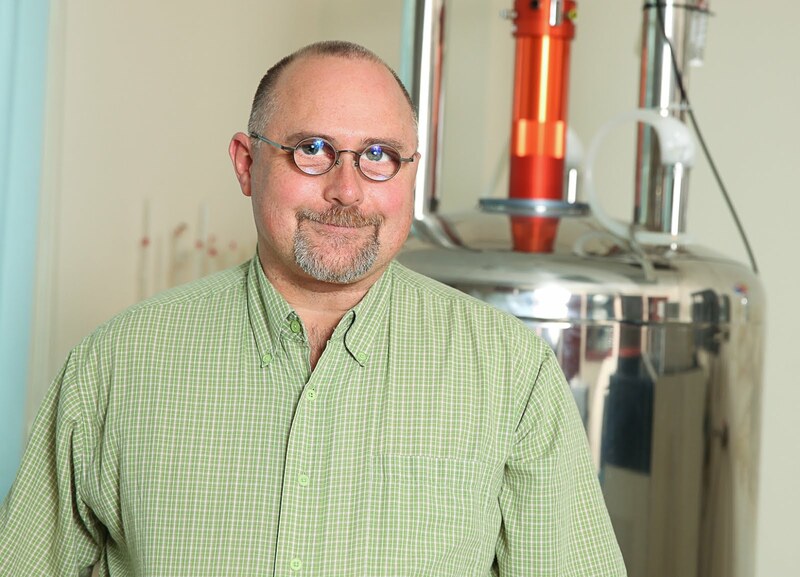 Proton detected Heteronuclear Multiple Quantum Coherence (HMQC) and Heteronuclear Single Quantum Coherence (HSQC) are both NMR techniques used to correlate the chemical shift of the protons in a sample to a heteronucleus such as 13C or 15N via the J coupling interaction between the nuclei. Since both techniques essentially provide the same information - a correlation map between the coupled spins - students sometimes ask which of these two methods is better and which should they use routinely. The difference between the two techniques is that during the evolution time of an HMQC both proton and X magnetization (eg: X = 13C ) are allowed to evolve whereas in an HSQC only X magnetization is allowed to evolve. This means that an HMQC is affected by homonuclear proton J coupling during the evolution period while an HSQC is not affected as there is no proton magnetization during the evolution time. The homonuclear proton J coupling manifests itself as broadening in the X dimension. 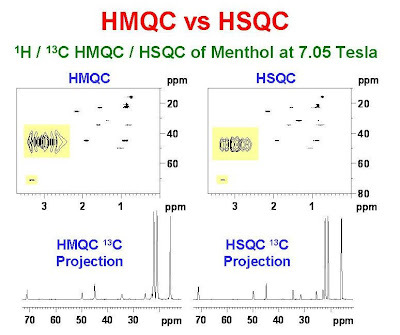 The top panel of the figure below shows the 7.05 T 1H /13C HMQC and HSQC spectra of menthol with an expansion of one of the resonances highlighted in yellow. One can see that the expanded cross peak of the HMQC is broader in the 13C dimension than that of the HSQC. The bottom panel of the figure shows the corresponding 13C projection spectra. One can see that the resolution is better in the projection of the HSQC compared to the HMQC. One might conclude that, due to the higher 13C resolution, it is always better to run an HSQC rather than an HMQC. This is definitely the case if all of the pulses are calibrated well, however since there are many more pulses in an HSQC compared to an HMQC, it is more susceptible to losses in signal-to-noise-ratio due to poor probe tuning or poor pulse calibration. My advice to students is that, if high 13C resolution is required, then make sure the pulses are calibrated well on a well tuned and matched probe and run an HSQC. If high 13C resolution is not critical then run an HMQC. In some cases, specifically RNA samples, HMQC's are preferred because of the relaxation pathway due to the multiple quantum versus the single quantum coherence levels. Thanks a lot. Really helpful !! I was always a fan of HMQC due to its robustness to poorly set pulse. The latest generation of adiabatic sequences have largely overcome this problem and HSQC is now my preference for small organic molecules. Good stuff, but i always use TROSY for my protein studies because of greater resolution and sensitivity. Thank you! The explanation is awesome! A really great introductory reference and selection algorithm for these two experiments. Thanks for taking the time to share it. Best regards from Long Beach C.A. Thanks for this post.All of your posts are very informative. Could you give some recommendations for a pulse sequence (1H NMR for low field) that would allow one to filter out solid or liquid-like phases where the sample = solid +liquid?